London, United Kingdom, 6th July 2017 – Premier Farnell, The Development Distributor, is partnering with TraceParts to provide CAD designs for 10,000 TE Connectivity products available to customers to download in multiple formats. Content provided within the library includes high-resolution images, technical documentation, attribution, features and benefits along with descriptions to assist customers with their design selection. Downloadable CAD files in multiple formats will include products from TE Connectivity brands specifically; Alcoswitch, AMP, P&B, Raychem and Schrack, and new products will be added on a regular basis. Premier Farnell also provides CAD files for over 250,000 products on its www.farnell.com, www.newark.com and www.element14.com websites. TraceParts is a world leading digital media company for engineering. To use the service, engineers simply create an account on the TraceParts website allowing them to choose 3D CAD file they wish to use and then download the file. The process is frictionless. TraceParts is one of the world’s leading providers of 3D digital content for engineering. As part of the Trace Group founded in 1990, the company provides powerful web-based solutions, such as CAD part libraries, electronic catalogs and product configurators. 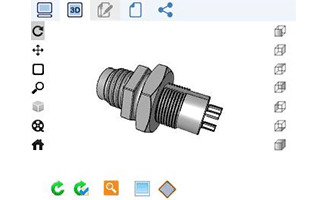 The TraceParts portal is available free-of-charge to millions of CAD users worldwide. It provides access to hundreds of supplier catalogs and more than 100 million CAD models and product data-sheets that perfectly meet the specific needs of design, purchasing, manufacturing and maintenance processes and operations. Premier Farnell is a business unit Avnet, Inc., (NYSE:AVT). Premier Farnell trades as Farnell element14 in Europe, Newark element14 in North America, and element14 throughout Asia Pacific. The Premier Farnell Group is supported by a global supply chain of more than 3,500 suppliers and has an extensive inventory profile developed to anticipate and meet the needs of innovative customers everywhere. Premier Farnell also sells direct to consumers through a network of resellers, as well as its MCM business in North America and CPC business in the UK.